The Kid Grace Learning Center, a program of Grace Temple Ministries, in Temple, Texas, finished building a Nature Explore Outdoor Classroom through the extraordinary work of the church Brothers, who comprise the Men of Integrity. When the Men of Integrity of Grace Temple Ministries take an interest in a project- it gets done. Brothers Brannon Sledge and Calvin McLean heard a talk by Nature Explore’s Tina Reeble, and they were excited by what they heard. Nature-based learning was entirely new to them, and they embraced the outdoor classroom concept wholeheartedly. With funding support from the U.S. Forest Service and Workforce Solutions, funds raised from church members, and with work by the church Brothers, the outdoor classroom construction started. Church Bishop D. S. McBride, Brandon, and Calvin coordinated labor by the church Brothers, and the donated labor of M&M Construction, and Brown Construction. When extra supplies were needed on short notice, church Brothers dug into their own pockets. Church members and family also pitched in. 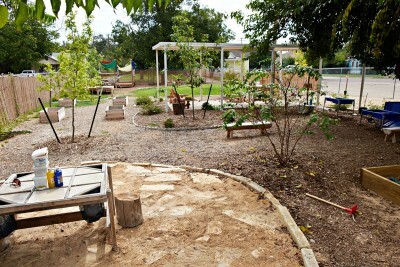 To prepare the space, traditional play structures and pea gravel were removed. The outdoor classroom was built very quickly with parents and children involved in planting during the grand opening celebration, immediately drawing them into the spirit of the space. The hot, dry environment of Central Texas posed both challenges and opportunities for the space. Shade and water are important. The Kid Grace outdoor classroom has a large water activity area, a covered building area, and shade trees are being planted. The water area consists of a very popular pump, many floatables, and large tubs which see a lot of activity. The environment wasn’t the only challenge. A few large trees reside at the periphery of the space, but new trees were planted to increase the shaded areas. After some early failures in getting the plantings to thrive, The U.S. Forest Service in Austin provided invaluable information on resilient trees and their care, and offered to assist as the classroom evolved. Read more about the Kid Grace Learning Center at the Nature Explore blog. 801 s. 13th Street S.